When Turtle began to eat solids I decided that our household needed to increase the amount of organic fruit and vegetables that we eat. My main reason: to reduce the amount of pesticides in our diet. Particularly Turtle's diet since she is so small and it seems like food is becoming more of a commodity and less of a natural product every day. Another benefit is that organic produce is grown to promote and nourish the soil and environment. It is a holistic process that minimises damage to the environment. I believe that this has so many benefits and definitely should be supported and encouraged. I started scouring the shelves of our local fruit and vegetable stores for organic produce (since we were time poor and struggled to get to the local Farmers Markets). I found their range to be limited and I had an ethical struggle regarding the amount of plastic that the organic produce was wrapped in. What a choice, buy the standard food without packaging or the organic food triple wrapped in plastic and sometimes even on a styrofoam (I know, shops still use styrofoam in Perth!!) base. I needed another alternative. A friend told me about an organic fruit and vegetable box that she had delivered at around this time. She wasn't 100% happy with it because she had received lots of oranges and didn't eat them. I also saw a conversation about organic food on a Facebook site where someone said that they had organic fruit and veggies delivered and then would top up what they needed at the shops. It took a little while for me to get onto it but I found The Organic Collective's website and have not looked back. For the first few weeks I would ring up to place an order (rather than immediately organising an ongoing weekly order) for the Couples box. We wanted to find out what type of things would be included and to make sure we were happy with the amounts we received. The thing I noticed straight away was that we ate so much more fruit because the fruit bowl was full. It was also convenient having the food delivered, rather than having to go to the shops and trawl through the produce, looking at prices and labouring over packaging. Most of the time there is no packaging in the box. Sometimes the pumpkin is in a plastic bag. Apart from that there is generally none. I also loved that we were receiving seasonal produce and some products that I would never usually buy. Examples are squash, fennel, kale, corn and cabbage. This has caused us to become a lot more creative with our cooking. We have become huge fans of kale chips, quinoa and corn salads, fennel risotto and squash ratatouille. All of these meals have been tasty and really healthy. Mr Fix It was pretty sceptical of the value for money we would be receiving. He actually weighed everything we received in a box one week on our kitchen scales and calculated (estimated) what he thought it would cost. He decided that we weren't getting ripped off. Of course, it's not all bliss and good news. Some weeks I look in the fridge and see so many vegetables and I feel pressured to cook. While this is a good thing in some ways (at the moment I have piles of potatoes that I'm planning to make into a potato salad and I want to make tabouli with the copious amount of parsley growing in our garden) it can also be exhausting. Particularly when Turtle is teething and we haven't had a proper sleep in almost two weeks. The novelty also wears off when you have received oranges for weeks and you don't feel like eating oranges at all. You can ring up and ask for items to be added to your "dislikes" and stop them being delivered but I feel like that defeats the purpose of working with the seasons and natural rhythms of what is available to eat. We tend to only "dislike" things that we can pick from our garden. Although we got sick of the oranges I have made some amazing orange cakes this winter and now that the weather is heating up (I don't think we got any oranges this week actually) I have really enjoyed putting oranges into salads. Last week when there were lots of veggies in the fridge I cooked up the corn (boiling it for 5-10 minutes), blanched some asparagus and roasted some pumpkin and beetroot. While I was doing this I also cooked some tricolour quinoa on the stovetop. All of this didn't take too long although it meant I was pretty active in the kitchen for about an hour. I cooked everything with a plan to make two or three salads over the next couple of days, reducing the need to cook again so soon. I cut the corn kernels off the cobs and mixed them through the cooked quinoa. This is a winning combination, I highly recommend you try it. 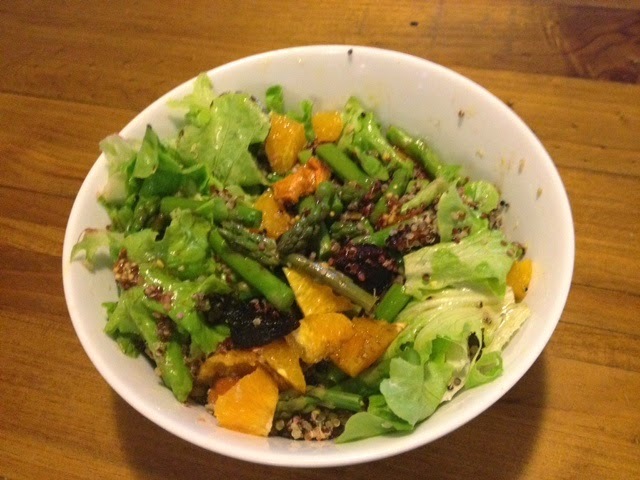 Then I cut up one orange and the asparagus, threw it in with the roasted beetroot and pumpkin, lettuce, and quinoa and corn mix, added some orange juice (squeezed from part of the same orange), olive oil, some seeded mustard, and balsamic vinegar. This was a beautiful salad to accompany the scotch fillets that I got at our local butcher when walking Turtle and the dogs. 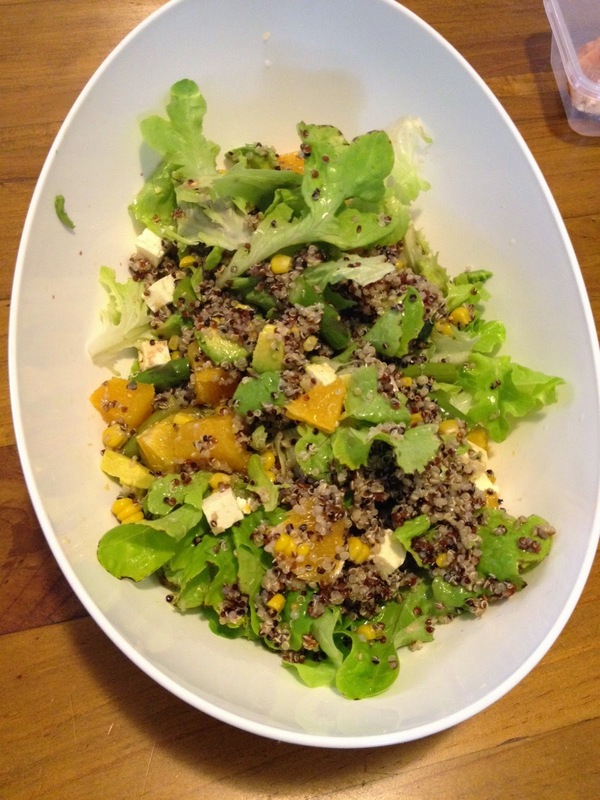 I also had plenty of leftover quinoa and corn, lettuce and pumpkin to make another salad within the next couple of days. I used these ingredients, along with avocados (which weren't ready when I made the first salad) and fetta to make the next salad. Both salads provided enough leftovers for at least one lunch the next day. This was definitely a winner! I'd love to hear about any seasonal recipes that you like to use when you have lots of vegetables to use up. I'm always keen to try something new. Well I best be off - I have to get started on those salads before Turtle wakes from her nap.